It is a normal tendency all over the world. People know nothing of a writer, have not read a word of his works and go through life perfectly oblivious to their existence. Then this writer happens to win the Nobel Prize in literature, and suddenly there is an upheaval of interest about the writer among the general people. Maybe this is also true for the other categories too, but those categories are not really very popular or accessible to the general people. Hence it is in literature that this tendency is noticed more than in any of the other categories in which the Nobel Prize or other equivalent awards are given. For academicians in the field of literature, and devout connoisseurs of it, Harold Pinter is not a new name. Harold Pinter, CH, CBE, is a British playwright, poet, actor, director and political activist who is often regarded as the foremost representative of British drama in the second half of the 20th century. To the less involved reader, however, the name may not sound so familiar. Following his being awarded the Nobel Prize in December 2005, however, a lot about Pinter is being seen in our newspapers and magazines. Continuing this trend, the Department of Theatre and Music, University of Dhaka, in collaboration with the British Council, organized a weeklong festival on Pinter's plays. 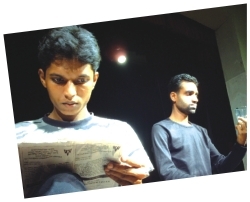 Students of the department translated his works and were also involved in the direction and staging of the plays. The Harold Pinter week opened on Monday, 4th September 2006 at the British Council Auditorium. The plays staged were: The Caretaker, Betrayal, Old Times, Night, The Lover, Dumb Waiter, Monologue and The Dwarfs. All the plays were staged at the British Council Auditorium. Alongside staging of Pinter's plays, his books were also on display from 4-7 September at the British Council library. The festival was drawn to a conclusion with a seminar on Harold Pinter on 8 September, 10 am at the British Council library. Eminent writer Syed Shamsul Haque chaired the seminar, which was attended by several faculty and students of the University of Dhaka. BRAC University organised Fresher's Orientation on the 20th of August 2006 for the students enrolled in Fall 2006. The program was divided into two parts, Day 1 at the BRAC Center Inn and Day 2 at the BU Campus, TARC Savar. The event was arranged in a festive mood, with faculty members, current students and BU alumnus all coming together to make the occasion a success. Day 1 was at the BRAC Center Inn, near the BU Mohakhali campus. Pro-VC Dr. Salehuddin Ahmed delivered a welcome speech to the newcomers. Faculty members as well as students spoke on the things to expect from BRAC University, and the responsibilities that the students must be willing to take on in order to forge an effective work environment. The first session ended with a brief on the second day's program. Students were then taken for a tour of their respective departments and the BU library. This was followed by a brief by their respective chairpersons. Day 2 was at the TARC Savar Campus. Transport was arranged for the students by BU authorities. Upon getting there, the students attended further briefing sessions on how to perform well in university, how to register for courses or find relevant information and the BU scholarship policy, among other things. Lunch and a cultural program in honour of the freshers followed this. The session ended at 15:00 PM, and students departed from the Savar campus for Dhaka by 15:05 PM. As an effort to familiarize the students with the co-curricular activities in BU, a club fair was organized on the 14th of September 2006. In order to prepare the students to face the challenges of professional life and introduce them to the vast arena of the corporate sector the Department of Marketing of Dhaka University is all set to organize a colourful program titled Career Development and Job Fair on 16 and 17 September 2006. The gala event is expected to generate enormous energy and interest among the students, as they would enjoy every minute of it being so close to the renowned corporate personalities of the country. The inaugural session is expected to be attended by the DU Vice Chancellor and Pro Vice Chancellor, Treasurer, Deans of Dhaka University, President of FBCCI, faculty members of various departments of DU and hosts of distinguished guests. On the first day a seminar on career development is scheduled to be held. The theme of the seminar is 'Newer Challenges and Greater Opportunities: how a business graduate should welcome these issues in this age of globalization.' Some more seminars on relevant issues with appropriate theme are on the agenda. The Job Fair will be made visually attractive with stalls set up outside the seminar room where students would freely interact with the top executives, CEOs and business leaders of the country. They would submit their CVs to them and learn a few things about how the wheels of business are kept moving all the time to attain progress. The whole show has been designed to expose the students to a new sphere in life, which otherwise becomes a difficult undertaking at such early stage. THE “IBA National English Debate Championship 2006” organized by the Institute of Business Administration Debating Club (IBADC), has started from September 15, 2006. The finals of this debate competition will be held at 6 pm today (September 17th) at IBA auditorium. American International University of Bangladesh (AIUB)Asian University of Bangladesh (AUB),BRAC University, Chittagong University, Dhaka Medical College, Dhaka University Debating Society (DUDS), Eastern University, East West University, Independent University of Bangladesh (IUB), Islamic University of Technology (IUT), Gazipur, London College of Legal Studies, North South University (NSU), Rajshahi University, Stamford University,Institute of Business Administration (IBA), University of Dhaka. FACULTY of Social Sciences of University of Dhaka awarded graduates in appreciation of their outstanding results in BSS (Honours) and in MSS examinations. The ceremony was titled the Dean's Award. The event was held at the TSC auditorium on 14th September. 13 students, 5 from 2003 batch and 8 from 2004 batch were awarded in the ceremony. The awardees from 2003 batch are: Mushfikur Rahman from economics, Ranzon Bishwas from International relations, Farida Islam from sociology, Asif Muhammad from Public Administration, and Israt Jahan from Anthropology. The awardees from 2004 batch are: Mir Nahid Mahmud from economics, Abu Sayid from Political Science, Kajolie Shehrin Islam from Mass Communication and Journalism, Md.Ashraful Haq from Public Adminstration, Syed Arman Hossain from Anthropology, Lipon Kumar Mandol from Sociology, Mohammad Abdul Salam from Peace and Conflict Studies and finally Akond Mohammad Faisal Uddin from Development Studies. About the event Dr. Harun-or-Rashid Dean, Faculty of Social Sciences said, "We have chosen only those students who have secured their first class first position without any study break. 12 students have been awarded for their outstanding performance in BSS (Honours) and one for standing first class first in MSS." One hundred years of Curzon Hall and more…. Dhaka Physics Group celebrated the International Year of Physics 2006, hundredth anniversary of Einstein's special Theory of Relativity, centenary of the Curzon Hall and also launched the book “Our Alma Mater” at the auditorium of Curzon Hall last Tuesday (September 12, 2006). 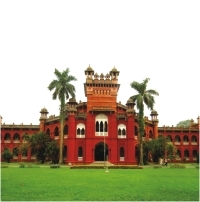 Since inception, the University of Dhaka has been a place of work of many great scholars and scientists. From 1926 to 1945 renowned physicist Satyendra Nath Bose worked as a professor. It was during this period that he published his famous papers in collaboration with Albert Einstein, most notably defining Bose-Einstein condensate. It is worth mentioning here that Physics Journals had refused to publish Bose's paper. It was their contention that he had presented to them a simple mistake, and Bose's findings were ignored. Discouraged, he wrote to Albert Einstein, who immediately agreed with him. Physicists stopped laughing when Einstein sent Zeitschrift für Physik his own paper to accompany Bose's, which were published in 1924. Bose had earlier translated Einstein's theory of General Relativity from German language to English. It is said that Bose had taken Albert Einstein as his Guru. The programme started with the welcome speech of Prof. A.M Harunur Rashid UGC professor of physics. He briefly discussed the history of Curzon Hall and the Einstein's Theory of Relativity and how Curzon Hall became a part of the history. He also paid his tribute to the icons of physics and mathematics. Dhaka Physics Group is an association of former students of the department. Justice Habibur Rahman former chief justice and former head of the caretaker government of the Peoples Republic of Bangladesh attended the event as chief guest. BANGLADESH Society for Total Quality Management (BSTQM) is all set to organize the First Annual Quality Convention on Education in Bangladesh jointly with the University of Asia Pacific (UAP), Real Estate and Housing Association of Bangladesh (REHAB) and Bangladesh AOTS Alumni Society (BAAS) on 15 and 16 September 2006. The program includes paper presentation for teachers and professionals and SQCC-case study presentation, college, debate, poster, quiz and skit competitions to be participated by students from various school, colleges and universities. The theme of the convention is “Quality in Education: An Initiative to Develop Total Quality Person”. Besides representatives from the educational institutions across the country, there will be delegates from countries in the South Asian region. The Minister for Education, Government of Bangladesh is expected to inaugurate the Convention. This is a part of UAP to be involved in the growth and development of education in the country. 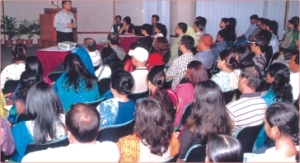 The Orientation program at Asian University of Bangladesh for the new intakes of Fall Semester 2006 was held on 8th September 2006 at 10:00 am at its Uttara Campus. Addressing the function Professor Dr. Abul Hasan M. Sadeq, Vice-Chancellor of AUB said that Asian University is the pioneer university in private sector in Bangladesh, which is imparting higher education in dual system - on-campus and distance mode. Under the system of distance education generally three classes of students, mainly poor but meritorious, service holders and housewives are getting facilities of higher education. In his address he also pointed out that AUB has adopted an inter disciplinary and ethico-human approach so that its graduates could be professionally sound and morally upright and equipped with multidimensional insight to face the challenges of the real life in the complex world. Mr. Iqbal Sobhan Chowdhury, Editor of the Daily Bangladesh Observer showed keen interest on AUB's curricular and co-curricular activities in his address as chief guest. He also highlighted AUB's reasonably fee structures, standard of teaching, congenial atmosphere and students discipline. In his speech he also emphasized mutual co-operation between press media and educational institutes for further improvement of the higher education sector of the country. Prof. Dr. Md. Kayser Hossain, Pro-Vice Chancellor: Treasurer Mr. MA Afzal: Prof Md. Serajuddin, Head of Bangla Dept: Dean Professor Dr. Abdul Awal Khan and two representatives from Old and New Students also addressed the occasion. The students of Daffodil International University (DIU) celebrated the inauguration of their English Language Club with style. The colourful ceremony featured cultural and drama events. Students of the English department staged short plays based on Hamlet, Macbeth and Waiting for Godot. Other performances by students included English songs and poem recitations, Rabindra Sangeet, Gazal, Zari Gaan and modern Bangla songs. The main attraction was a colourful fashion show. Solely performed by the students the show became the event of the day.The programme was presided over by the head of the department of English Prof. Dr. Khandakar Rezaur Rahman. Vice Chancellor of Daffodil International University (DIU) was the chief guest at the event. STAMFORD Debate Forum (SDF) organized a 4 day long workshop on debate at the Siddeswari campus. 29 students from different departments of Stamford University Bangladesh participated in the workshop. In the opening ceremony on 26 August 2006 (Saturday) the speakers commented on the need of this kind of workshop to hone the skills of the students in debating. In the first three days several sessions were conducted by experts on presentation, traditional and parliamentarian debates, preparation, definition of motion and challenging definition, team strategy etc. The closing ceremony of the debate was held on 6 September 2006 (Wednesday) at 5 pm in the auditorium of Siddeswari campus. Certificates and prizes were handed over to the winners in the ceremony.